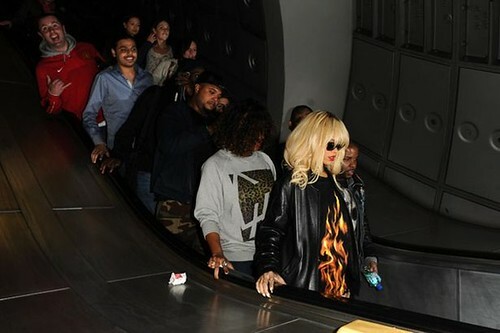 Apparently Rihanna has become obsessed with the London Underground since her recent visit. You've probably spotted pictures of her travelling inconspicuously around on the Tube last week, standing on the right side of escalators and using her travelcard (not sure why she hasn't got an Oyster card yet). The Sun gleefully reported that her "interest in the London Underground is one step away from turning her into a greasy-haired, trainspotting anorak." Why's that The Sun? Well she's put a load of Tube furniture from London Transport Museum's shop on her wishlist - presumably for one of her many abodes. Her mates told her about BBC2's The Tube documentary, she watched a number of episodes, found many of the characters funny and after "necking a few glasses of wine" Googled the Tube and came across the furniture from the Museum's shop. 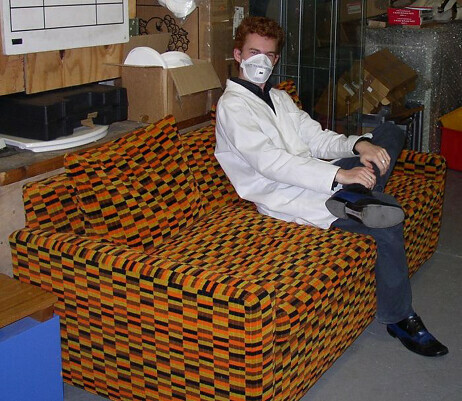 The Sun describe the store as selling "everything from a £3k patchwork sofa using all the retro-patterned seat fabric — known by anoraks as moquettes — to a Travelcard pillow. Just the trick if you are at a loss over what to get the missus for her next birthday." This story amuses me on so many levels. The headlines "Tube gets a Jubi-Rih Line" & "Singer takes her Underground obsession Tube far" must have taken seconds to compose and are laughably lame. 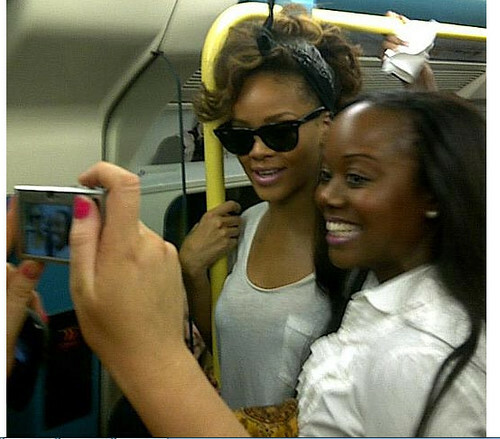 Also the Rihanna travelling on the Tube part is possibly the least interesting part of the story for me. She found she made the headlines last October when she was snapped by commuters inside a Tube carriage and posed quite naturally with a number of fans. Fast forward a few months and she now travels on the Tube somewhat more self consciously, striking poses by roundels and wearing hot pants. Yeah, yeah, this is all good stuff for the paparazzi to be all over and it makes her "one of the people". Photo from The Sun What I find the most amusing is how The Sun have managed to get a Showbiz story out of this. One of her mates told her some of her mates they'd been having some drinks together and watched The Tube on iPlayer. The "source" who could be several times removed from Rihanna said "Rihanna had sunk a few bevvies by the time they started looking through the Tube furniture. She thought it would be hilarious to bring some of it back home to LA with her. "She loves using the Underground because it means she can skip all of the traffic, but also because she reckons it brings her closer to the capital city." I love how The Sun also think that liking or buying Tube furniture somehow turns you into a "greasy haired trainspotting anorak". Nice! They will probably be laughing on the other side of their faces when Rihanna spots some of the Tube underwear and poses in a Mind The Gap thong or some Animals on the Underground knickers whilst seductively dancing around with her London Underground moquette umbrella ella, ella, ella, hey, hey, hey. 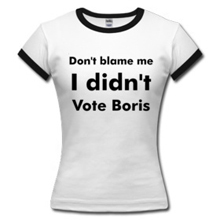 In the meantime us "anoraks" who already have such items will be smug in the knowledge we were ahead of the curve. Come on The Sun surely you know that nerds and geeks are the new trendsetters. You only need to look at the number of oversized dark rimmed glasses the fashionistas are wearing to understand that. Soon Rihanna will be hanging out with Gwyneth Paltrow and asking how she perfected her London accent when she was in Tube film Sliding Doors. And one final thing The Sun - "retro-patterned seat fabric" isn't just "known by anoraks as moquettes". That's its name and it's moquette without the "s", to say moquettes would be like saying sheeps. If you're going to mock trainspotters at least get the terminology correct!